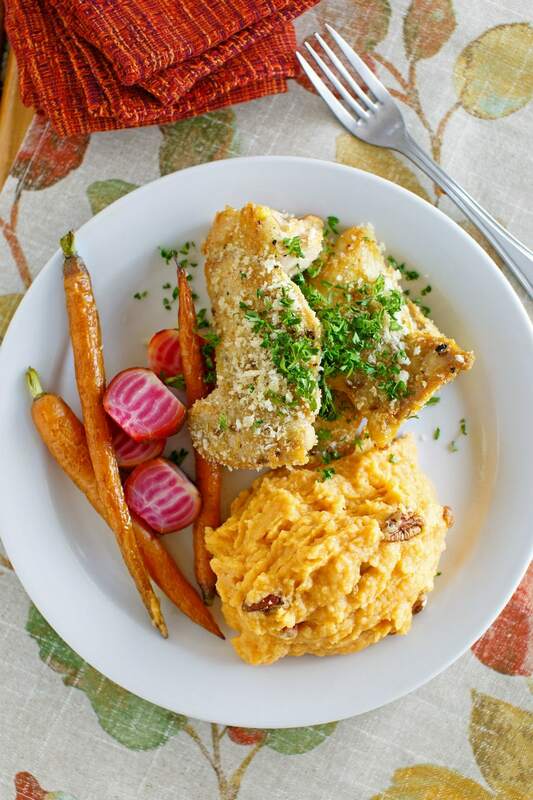 These Creamy Mashed Sweet Potatoes need to be on your holiday table. 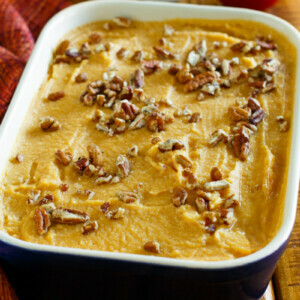 They’re a wonderful base of creamy sweet potatoes topped with sugar and spiced pecans. 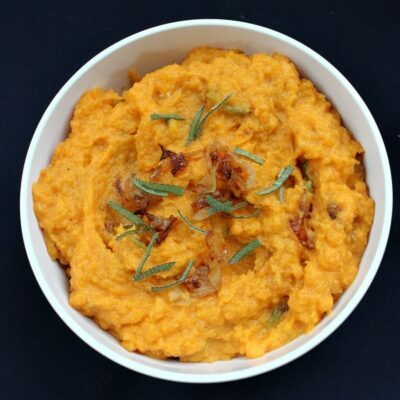 What ingredients are needed to make Mashed Sweet Potatoes? 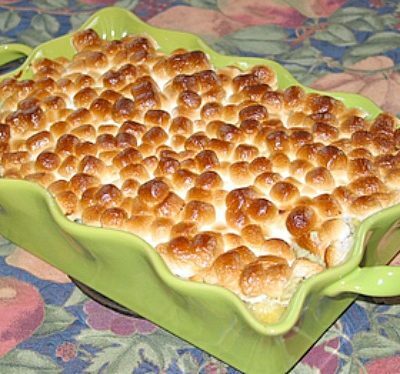 You’ll need 3 pounds of sweet potatoes with orange flesh, brown sugar, and a little bit of half and half cream. The ground spices included in this recipe are nutmeg, ginger and cinnamon. For the topping, you’ll also need chopped pecans and a fresh orange to make some orange zest. 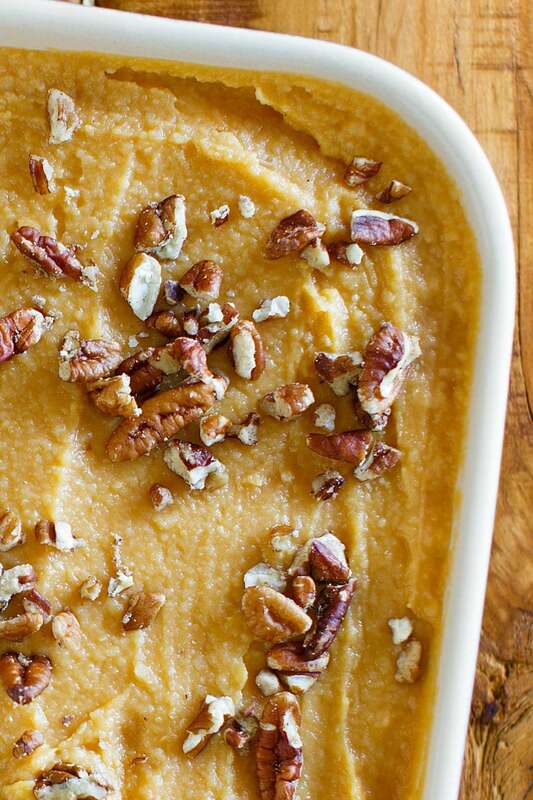 How do you make Creamy Mashed Sweet Potatoes? The first thing you’ll do is bake the potatoes. Give them a good scrub to remove any dirt, poke them all over with a fork, and wrap each of them in foil. They’ll bake in the oven about an hour, until tender. Then you’ll remove the skin, and mash the potatoes while combining them with brown sugar, cream, and spices. This mixture is spooned into a casserole dish, and then the potatoes are topped with a pecan/sugar/spices/orange zest mixture. 20 minutes in the oven, and your Creamy Mashed Sweet Potatoes are done, and they’re ready to serve. Yes! To prepare Creamy Mashed Sweet Potatoes ahead, spoon the cooked, mashed and spiced up sweet potato mixture in 13×9-inch dish without adding the topping. Cover with plastic wrap and refrigerate. When ready to bake, remove from refrigerator and let stand 20 minutes at room temperature. Sprinkle the topping mixture evenly over potatoes, and bake at 350 degrees for 20 minutes or until thoroughly heated. If you’re anything like me, you tend to get a bit confused by these two! There is orange flesh and white flesh and they’re all kind of jumbled together at the store. And when I want the orange sweet potatoes, they’re really labeled as “yams!” Help! Here’s the deal. The sweet potatoes and yams that you’re seeing at the market are more than likely ALL sweet potatoes. Hard-type sweet potatoes are the brown ones that have a white interior flesh. Softer-type sweet potatoes are the purplish-skinned potatoes with an orange interior flesh. These purplish ones are often labeled as “yams” at the market, but they’re really sweet potatoes. How confusing is that?! You want to look for the purplish exterior, orange fleshed sweet potatoes for this recipe. Your market will probably have them labeled as “yams!” Don’t fret. Ignore that, and buy them anyways. REAL yams are African and Asian in origin. It’s not likely that you’ll even spot them in a regular grocery store, but they do carry them in international markets. They are starchier and drier than a sweet potato. If you’re looking for side dishes for Thanksgiving, Christmas or Easter (you know… one of those holidays where you like to make a fancy, packed menu full of stuff), then here’s a recipe you’ll want to add to your collection. 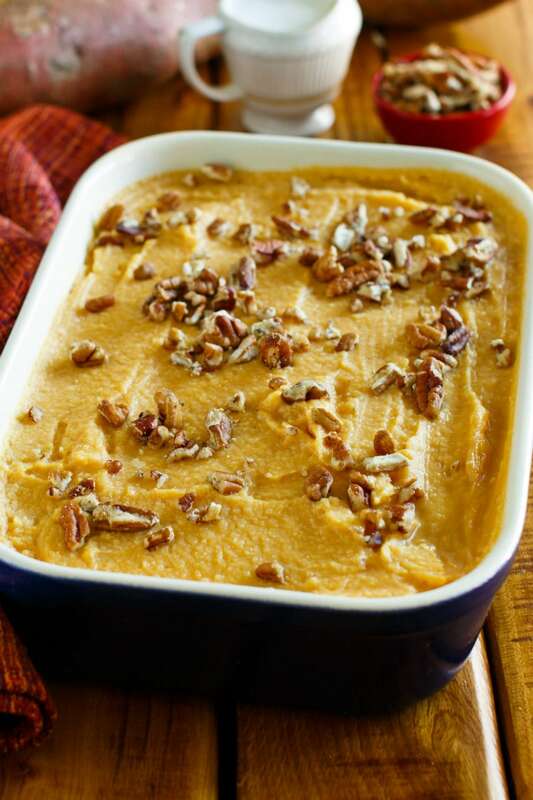 These sweet potatoes are a creamy bite of deliciousness, with added crunch from pecans. They will go very well served with turkey or ham, and they’d even be a nice addition to a roasted chicken dinner. 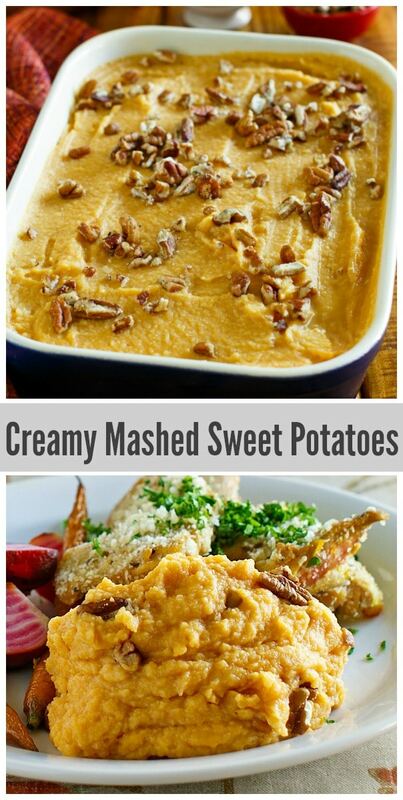 Everyone seems to love a good sweet potato side dish, so these Creamy Mashed Sweet Potatoes are the perfect choice. If you’re looking for more holiday side dish recipes, you might also enjoy my Roasted Butternut Squash Gratin or this Quick and Easy Make Ahead Gravy. 5-Ingredient Corn Casserole, Make Ahead Mashed Potatoes and Brusssels Sprouts Gratin are also great ideas for holiday sides. 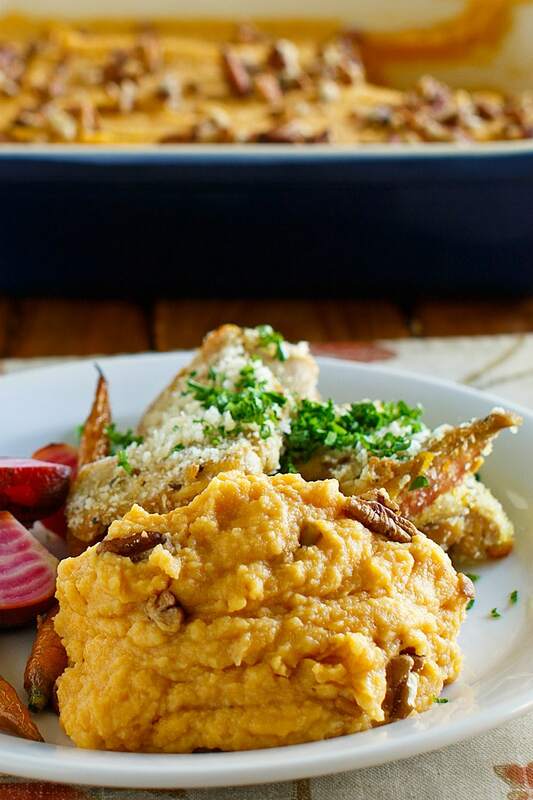 These Creamy Mashed Sweet Potatoes are the perfect potato holiday side dish! Orange- spice flavored and dotted with pecans, this is a favorite recipe. Preheat the oven to 400 degrees F. Bake the potatoes for 1 hour or until tender; remove the peel. Reduce oven temperature to 350°. In a large bowl, mash the potatoes, then beat with brown sugar, half and half, nutmeg, ginger, and cinnamon at medium speed with an electric mixer until smooth. Spoon the mixture into a 13x9-inch baking dish coated with cooking spray. Combine the topping ingredients in a small bowl; sprinkle evenly over the potato mixture. Bake at 350° for 20 minutes or until thoroughly heated. To prepare ahead, spoon cooked sweet potatoes in 13x9-inch dish without adding topping. Cover with plastic wrap and refrigerate. When ready to bake, remove from refrigerator and let stand 20 minutes at room temperature. Sprinkle the topping mixture evenly over potatoes, and bake at 350 degrees for 20 minutes or until thoroughly heated. This recipe was originally published in 2006. It was edited and republished in 2018. Love how these are so creamy! Such a great side dish! Thanks for explainging the difference. We love them all, and this recipe is so creamy and good! The spices + that little bit of orange zest are perfection! 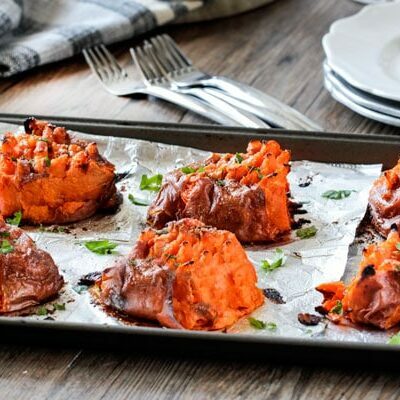 Love the addition of orange in this sweet potato recipe. These are SO good. Love the hint of orange. Making this next week for Thanksgiving. Thanks for such a great recipe. Totally making these for the holiday! Can’t wait! So simple and tasty!! Perfect addition to the Thanksgiving table! !